unmarried partners are welcome to attend. If you haven’t yet seen it, read our overview description of the retreats + FAQs. We offer two different types of retreats: a Private Retreat where just you and your partner work with John, and a Group Retreat that you share with other couples. Below you can read all the details for each type of retreat. You will also find our calendar of available dates. Our Healing Couples Retreat Center is in California, located in the northern San Francisco Bay Area. It is set in the western part of Sonoma County, in the friendly small town of Sebastopol. Sonoma is one of the premiere grape-growing areas in the world. 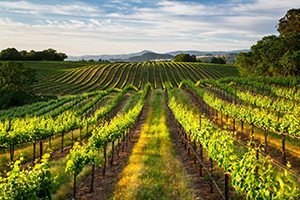 The landscape is a breathtaking patchwork of vineyards spread across gentle hills, offering one of the most beautiful terrains in California. 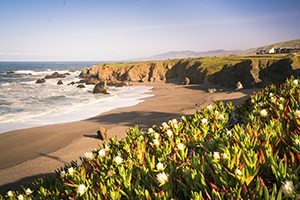 There are many things to see and do while you have your retreat in this part of California. 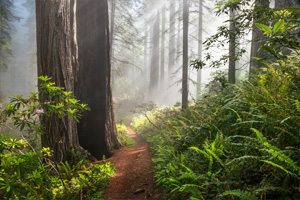 The activities and sights will take you from serene redwood forests, to scenic rivers, out to expansive beaches and the rocky coast of the Pacific Ocean. Add top quality restaurants, the charm of small towns set amidst wineries — and you can easily feel like you’re in Tuscany! For a California couples retreat location, you can’t find a more charming spot! You and your partner work with John. You have his full attention for 6 hours a day. Private Retreats are usually 3 or 4 days in length, as this provides ample time to resolve issues and integrate the new tools you learn into how you’ll interact once you are back home. We recommend a 4-day length if you are under the distress of past affairs, traumas, or significant emotional wounds; if someone’s deeply ambivalent about staying married; or if you have multiple significant issues. You can also elect to have a 5-day length if you can afford spending the time, if you have particularly difficult and intractable issues to resolve, or if you simply want to take more time for healing and reconnection. For couples not in distress, but looking for a tuneup or followup retreat, a 2-day length may be sufficient, but please check this with us first before booking this shortened retreat. A Private Retreat can be over a weekend or during the week. Hours are from 10:30 am to 6:00 pm, with a good hour and a half lunch break. You may also have a bit of optional work to do outside of sessions. And there is powerful preparatory work that many couples say shifts things in a positive direction even before you get to your retreat. Many couples who have either the need, time, resources, or interest choose to do a 4-day retreat. The added length of time helps you achieve deeper results in acquiring new, positive communication tools. The added time can also help you more deeply heal old emotional wounds and shift into a place of trust and re-connection. The Private Retreat gives couples a rare level of personal coaching and provides profound depth of positive transformation and change. The private format is by far in the highest demand by couples, who want to take significant steps to make meaningful improvements in their relationship. MORE INFO: Read more about what happens in a Private Retreat. TESTIMONIALS: See feedback about what couples say after a Private Retreat. COST: The per-couple cost is $8850 for the 3-day Private Retreat, and 4-day or 5-day retreats are proportionally priced. DATES: Private Retreats are offered throughout the year on any available days of the week. Look below for our calendar of available dates. FOLLOW-UP: You can get online follow-up coaching to help you integrate the tools and changes you acquire in a retreat and keep moving forward on a positive track. In our Group Retreats you and your partner join other couples to share a retreat. The group size is kept small enough to enable you to receive personal coaching and individual focus. This is especially so in our special extra small groups, where enrollment is limited to between 4 and 7 couples. Our regular group size ranges from 12 to 16 couples. People often ask how the Private Retreat above compares with our Group Retreat, and what is more appropriate for them. The basic answer is that it all depends on your needs and goals. Even though we keep our group size smaller than typical retreat programs, and you will receive individual attention, private work offers the most intensive level of coaching for couples suffering significant distress or stuckness, and who want to address major issues. If you are in significant distress you will benefit from in-depth, individually tailored coaching available in a Private Retreat. That said, we especially find that our special extra small Group Retreats routinely turn around marriages on the verge of divorce, help couples recover from infidelity, and successfully negotiate many other major issues. Couples report there’s special power being in a group! You get to see other couples and experience a shared energy of positive change. Some couples supplement this retreat with an add-on full-day private session with John, or come back later for a Private Retreat. Online follow-up coaching is available, to help you integrate the tools and changes you acquire in the retreat into your lives back home. MORE INFO: Read more details about what happens in a Group Retreat. TESTIMONIALS: Read feedback on what couples say about our Group Retreat. COST: The per-couple cost is $2350 for our regular group size, and $2950 for our special extra small groups. TIMING: Group Retreats start Friday at 1:00 PM and end Sunday at 4:00 PM. DATES: Upcoming groups are scheduled for June 21-23, July 26-28, Aug 31-Sept 2 (Labor Day), Sept 13-15 and Oct 18-20, 2019. CONTACT US: If you want to ask questions about our Group Retreats contact us. More Details — What happens in a group? An overview of our retreats? What issues or goals are addressed? Are religion or other beliefs involved?